Virat Kohli made 68* to take RCB to 175. Royal Challengers Bangalore hosted Kolkata Knight Riders at the M Chinnaswamy Stadium in Bengaluru for the 29th match of the IPL 2018. KKR was coming off a demoralizing loss at the hands of DD, while RCB suffered a shock loss to CSK sometime back. KKR skipper Dinesh Karthik won the all-important toss and chose to chase. RCB had made four changes bringing in Brendon McCullum, Manan Vohra, M Ashwin and Tim Southee; as AB de Villiers missed this match due to Virat fever. KKR went in unchanged, showing confidence in Shivam Mavi, who went for 58 runs against DD. RCB openers McCullum (38) and De Kock (29) started cautiously and added 67 runs in 8 overs. However, birthday boy Andre Russell dismissed McCullum and Manan Vohra in two consecutive deliveries to peg back RCB. But Virat Kohli spearheaded the RCB batting in the last few overs and remained unbeaten on 68 off 44 balls with 5 fours and 3 sixes. Mandeep made 19 and De Grandhomme made 11* and along with Virat’s brilliant knock, took RCB to 175/4 in 20 overs. Andre Russell with 3/31 in 3 overs was the most successful KKR bowler. Sunil Narine (27 off 19) and Chris Lynn gave KKR a very good start when the rain came down and stopped the match. When the match resumed, Narine was dismissed by M Ashwin after adding 57 runs for the opening wicket. Uthappa hit 36 off 21 balls with 3 fours and 3 sixes, before M Ashwin dismissed him, as he added 49 runs for the second wicket. In the end, it all came down to 43 runs off last four overs, as Lynn and Rana looked to take KKR to the win. However, Rana got injured and left the field and Russell was dismissed by Siraj on the first ball he faced, putting KKR in a position of concern. However, Captain Dinesh Karthik came to the rescue and played a very good cameo (23 off 10 balls) to take KKR closer to the win, as he was dismissed by a brilliant catch by Virat Kohli. However, Lynn saw KKR through with a brilliant 62* off 52 balls with 7 fours and 1 six. This loss was crushing for RCB, who had a decent score on board, but dropping Lynn at 7 and then not bowling accordingly gave them another loss, making it 5 defeats out of 7 games and their dream of playoffs qualification becomes distant. KKR, on the other hand, kept their fourth position in the points table with this nice win. 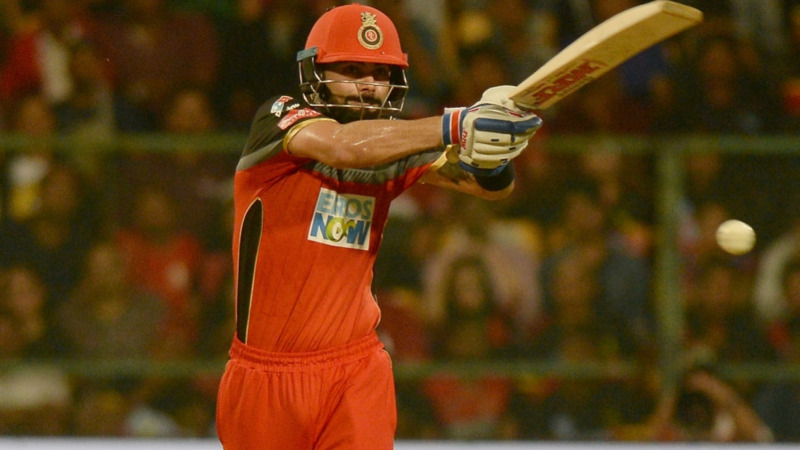 RCB 175/4 (V KOHLI 68*; A RUSSELL 3/31) lost to KKR 176/4 (C LYNN 62*; M ASHWIN 2/36 ) by 6 wkts.